Last release of 2013 is a smasher. 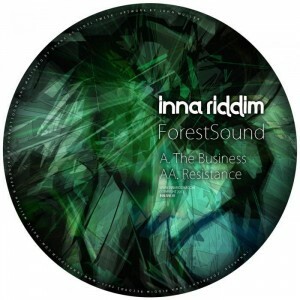 Debut release from producer ForestSound showcases his versatility in drum&bass stylings with these two powerful tracks.‘The Business’ takes a less-is-more approach that’s no less rugged and menacing for its minimal aesthetic. A gong is struck somewhere, echoing across a ruined soundscape, evoking an expanse of broken concrete watched over by stealth drones. Rattling percussion underpins the rhythm laid down by tight, punchy drums, while two basslines – a descending pulse, and off-kilter waves of layered sine girded up with a fuzzy sub – battle it out for supremacy over the blasted void. Stripped-down, rolling, and utterly lethal. A snappy, hihat-oriented beat leads into ‘Resistance’, with distant, ominous FX drenched in wind-tunnel reverb. Then the bassline comes in, subtly at first, but as the initial high-pass filter is swept away, we’re launched into the energetic main beat and an insistent, urgent bassline. Distortion encroaches at the edge of audibility, but the tune is marked by ForestSound’s crisp, precise sound, with funky percussion and pops to jazz up the rhythm. After a few moments’ quietude in the breakdown, the second drop reverses the bassline and changes up the energy. Driving, high-pressure and militant. Listen to the tracks below. Available on many digital retailers including JunoDownload.